When Dionysios Dionysiou was a child on the island state of Cyprus in the late 1960s, his family got drinking water from a communal fountain each day. 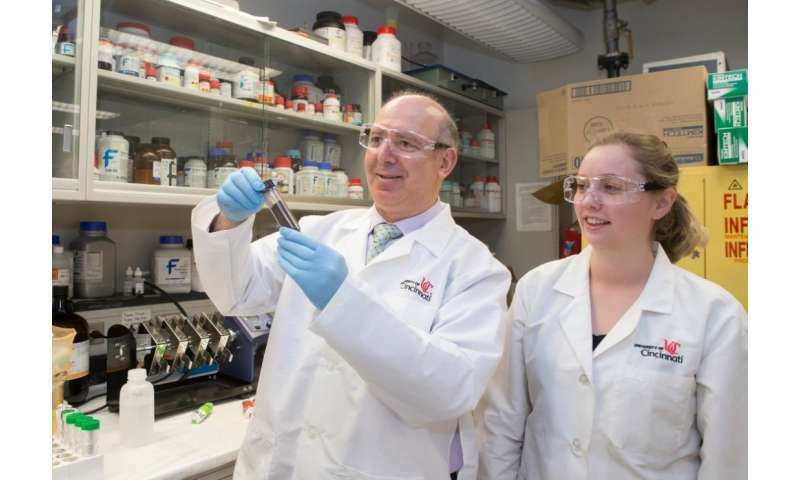 The University of Cincinnati environmental engineering professor has been preoccupied with water for most of his life. Today, his Mediterranean hometown has modern plumbing, but water remains a precious and finite resource, especially in drought years. "I was always fascinated by water," he said. "I grew up in a place where water stress was an issue. And it's still an issue." Dionysiou, a professor in UC's College of Engineering and Applied Science, has dedicated his career to studying water conservation, pollution and treatment. He is a UNESCO co-chairman professor on Water Access and Sustainability and a fellow of the European Academy of Sciences and the International Water Association, a public policy organization. Dionysiou has studied water treatment and conservation from the United States to Egypt to China. This year the Royal Society of Chemistry bestowed on him its sustainable water award for his research. And in July, Dionysiou co-authored a paper titled "A path to clean water" with Oliver Olsson and frequent collaborators Klaus Kummerer and Despo Fatta-Kassinos that appeared in the prestigious journal Science. Can you tell me about the Science article? We developed an idea to write an editorial about pollution prevention because we thought that there was too much emphasis on water treatment and not enough on preventing contamination in the sources of drinking water. You can treat more and more but there are still micropollutants in the water. In principle, if you create this pollution, there will always be problems down the road. Look at all the microplastics. Now we find that there are microplastics in all the aquatic environments. And now they're banning straws and plastic bags. Why are we so bad at filtering out contaminants? I'm not saying we're bad at it. There are limitations of wastewater treatment. Treatment plants can't filter many or most chemicals. If you look at micropollutants such as antibiotics, they're measured in micrograms or nanograms per liter. But we don't know if even that small amount will cause antibiotic resistance or other problems. Because of advances in analytical techniques, we might reduce pollutants even further and measure them in picograms per liter in the future. But we'll always be chasing this target. Banning long-lived pollutants [such as polychlorinated biphenyls or volatile organic compounds]. We should encourage the use of chemicals that decompose or biodegrade in water. The limitations on treatment technology make preservation of clean water more important. People are trying. There are better practices and more effective pesticides that biodegrade. They didn't know PCBs would be a nightmare in the environment. They are so stable. But they bioaccumulate, and they're toxic. Today, we're using a lot of nanoparticles. There's an initiative to scrutinize them to make sure we don't create negative environmental effects. How is climate change expected to affect the availability of clean water? That's significant. If we see increasing temperatures, we'll have more water consumption and more concentrated water. We already see toxic algae blooms in places like Lake Erie. We have robust systems to purify water to federal standards. The question is whether the standards are sufficient. The EPA established regulations in the 1970s through the Clean Water Act. We have more toxic byproducts today. So regulations are coming slower than the scientific knowledge. Greater Cincinnati has a robust water treatment system with ample sources of water from the Ohio River and the Miami Valley aquifer. But should we be concerned about the future of our local water supplies? Our local utilities do a very good job. The cost of water is still low. But what are the challenges? Look at the Ohio River. It's one of the most polluted rivers in the country. There are things we can do better to protect the river. Water availability isn't the issue in the area. It's about water quality. We need to cherish our aquatic systems. The Centers for Disease Control and Prevention says an estimated 1.6 million people in the United States live in "water poverty" without access to clean drinking water or sanitation. We think of water quality as an issue in developing nations, but this suggests clean water is a problem everywhere. We have a large number of people in the world using all these resources. Many places overuse water for irrigation. We have problems with stormwater management. There are questions of discrimination—access to clean water in poor communities. We have water-quality challenges, an aging infrastructure. How many billions of dollars are needed for water infrastructure improvement? When you think about long-term sustainability, there are a lot of questions. How can we preserve our clean water? How do your students contribute to the research? Most of the credit should go to the hard work of my students. Almost all of my students work in water-quality projects. Some remove micro-pollutants and study engineered treatment systems and different processes and how pollutants degrade in the environment. Some work on sensors to detect micro-pollutants or the products of toxic algae called cyanotoxins. These students will be the future leaders. They will work in the United States or their own countries. They understand that the sustainability of the planet is everyone's responsibility. We also form strong collaborations with many other researchers and water professionals around the world, which creates ample opportunities for my group's students and scholars.